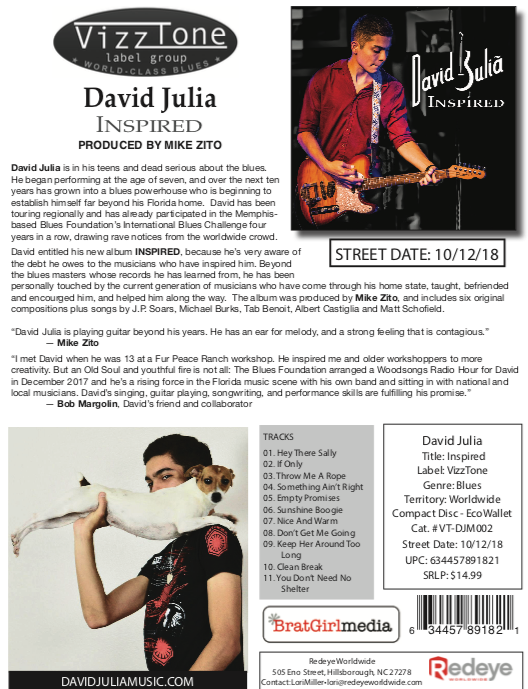 Click to Download "David Julia Poster w/Red Text"
"This cat is authentic and has a great command of the basics that he uses to stretch to the next level of the game." "At the ripe old age of 17, Florida-based David Julia is making quite a splash on the music world. His upcoming release, INSPIRED, is a delight on so many fronts that it boggles the imagination... David Julia is an old soul with skills I would find impressive in a man three times David's age. He has heart and soul. …. I was particularly impressed by the original numbers, which showed a level of maturity and understanding of the human condition. There is so much more here than just another head-banging wannabe. The ball is in his court... David Julia is damned good and shooting for greatness…. I recommend this disc highly. " 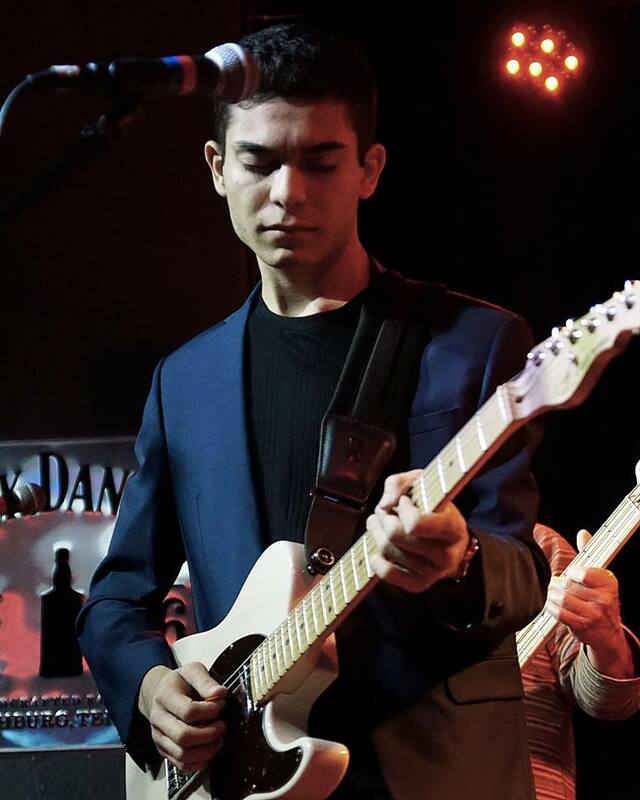 ​David is a 17 year old guitar prodigy who calls Central Florida home but who has made his musical mark across the country. His vocals, play and songwriting belie this young man’s years. He’s honed his skills under the tutelage of none other than blues master guitarist Steady Rollin’ Bob Margolin. David and Bob recently corroborated on a new cd, “Inspired”. Although he can shred the frets, David plays the blues from his soul and sings from his heart in a more contemporary and traditional electric blues style. This young man is a rising star who we will be hearing a lot about in the coming years. Many young prodigies have passed through the BBC including Rick Lollar, Heather Gillis, Katie Skene, Jamie Eubanks, Damon Fowler and Selwyn Birchwood, among many others. David is poised to join that group on his way to national recognition. He’s that good. Come see for yourself. Talk about a “pheenom”–David Julia is the epitome’ of the term. This Florida-based bluesman is all of SEVENTEEN years old, and he’s been performing since he was seven! He’s been to the IBC’s in Memphis four years in a row, and his latest album, “Inspired,” is a tribute to those players who have mentored and taught him. It’s produced by another big-time player, Mike Zito, and it was laid down at Marz Studio in Nederland, TX. Of the eleven cuts, six are David’s originals, and the covers are courtesy of a wide array of contemporary blues’ best. He has a strong vocal delivery as well, and begins this set with a cool, Fifties-inspired shuffle, “Hey There Sally.” He reprises that Fifties flair a bit later with the reverential love song, “If Only you were mine,” accentuated by the sanctified organ of Elliot Keys. The young man goes wise beyond his years with two socially-conscious cuts that served as favorites. First up, the minor-key “Throw Me A Rope” finds our hero dealing with friends “dying all around me,” fighting the battles of addiction. Then, the bristling “Something Ain’t Right” takes dead aim at the “one percent” who have it all, while the rest of us struggle daily just to get by. “Don’t Get Me Going,” is a good-time ode to youth, ’cause “I can go all night,” and David and Zito close the set with a playful acoustic duet. Even in the face of the brutal storms that have plagued the Deep South this season, “You Don’t Need No Shelter, long as I’m around!” David Julia is fulfilling his promise to those who have nurtured his talents, and is having a fun time doing it. Get “Inspired” by this powerful young artist! 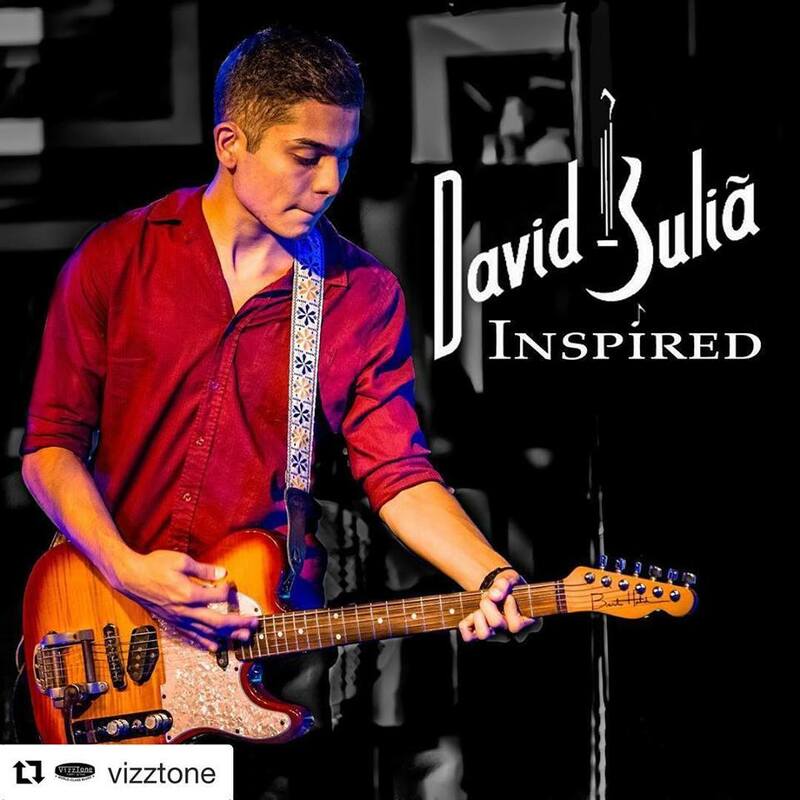 At just 17 years of age David Julia has already been playing guitar for ten years, has competed four times at the IBCs, counts the likes of Bob Margolin as a friend and now has Mike Zito producing this CD. David is based in Florida but this album was recorded in Texas. David wrote six tunes and there are five covers of songs by artists who have inspired him, hence the title of the album. David is on guitar and vocals, Matthew Johnson on drums, Lonnie Trevino Jr on bass, Elliot Keys on B3 and Lewis Stephens on piano; Mike Zito duets on guitar and vocals on one track. The album opens brightly with “Hey There Sally” which bounds along with a tricky riff over Elliot’s organ work before David cuts loose with a complex but controlled solo, all in just over two minutes. “Sunshine Boogie” is equally short and sweet as David adds some country picking to Matthew’s fast-paced drums, the only instrumental on the album. The pace drops for a slow blues in which David professes his undying love “If Only” she would be his, Elliot playing some delightful gospel organ and David showing a sure touch on guitar. David’s vocals and edgier guitar style on “Don’t Get Me Goin’” suit the song well. Album closer “You Don’t Need No Shelter” has a laid-back country style with David and Mike Zito on acoustic guitars as they share the verses and harmonize on the chorus. The other original “Throw Me A Rope” is track 2 on the album but to this reviewer’s ears seems inspired by Pink Floyd with its slow pace, heavier feel and dramatic lyrics about drug use and despair. The covers include songs by guitarists who have played in Florida and influenced David: JP Soars, Albert Castiglia and expat Brit Matt Schofield are all based there. JP’s “Something Ain’t Right” has a theme of needing to help those less fortunate than ourselves. Played over a thumping riff, David adopts a slightly deeper voice for this one, perhaps a nod towards JP’s own vocal style. Albert’s “Keep Her Around Too Long” is excellent with Lewis’ piano featured as David sings this one well over a jagged beat. Matt’s jazzy shuffle follows on lyrically from Albert’s song as David suggests that if the relationship is over it is best to make a “Clean Break” as he plays some really good stuff in the solo. David is a fine guitarist but, inevitably at such a tender age, his voice is still developing. The other two covers are a case in point as his vocals seem a little too ‘formal’ for Tab Benoit’s “Nice And Warm” though a sympathetic version of the late Michael Burks’ “Empty Promises” works well with some rousing guitar over warm organ support, David double-tracking his solo over his own rhythm work to great effect. Indeed, the biggest compliment is that after hearing David’s version I wanted to get out Michael’s original – inspiration in reverse! There is plenty to admire on this disc which shows a young man who must surely have a great future in the blues. The CD is therefore well worth a listen.